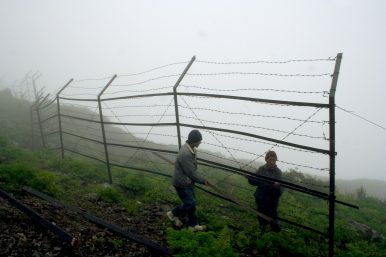 Indian workers prepare a barbed wire fencing along the India-China trade route north of Gangtok, capital of India's northeastern state of Sikkim, June 27, 2006. The trade route passes through the Himalayas at about 14,500 feet above sea level and was closed in 1962, during the India-China war. After more than two months, the tense standoff between the Indian Army and the Chinese People’s Liberation Army (PLA) on an obscure piece of Himalayan territory has come to a close. On Monday, the Indian Ministry of External Affairs (MEA) and the Chinese Ministry of Foreign Affairs each released statements noting that the situation had been resolved. The two statements varied in emphasis, but did not contradict one another. India said the two sides had reached a “disengagement understanding,” which led to the “expeditious disengagement of border personnel at the face-off site” in Dolam, part of Doklam region that is disputed between Bhutan and China. (See part one of this series for a primer on the political geography of the region.) MEA released a follow-up statement noting that the “border personnel of India and China at the face-off site” were withdrawing. Hua Chunying, a spokesperson for the Chinese Foreign Ministry, meanwhile, confirmed in a press conference that the standoff had ended, with India withdrawing “all its border personnel and equipment that were illegally on the Chinese territory to the Indian side.” Hua added that “Chinese border troops continue with their patrols in the Dong Lang area,” using the Chinese name for the Doklam region. The conclusion of the standoff comes ahead of a scheduled meeting of the heads of the BRICS group of countries, who will meet in Xiamen, China. The meeting will be the second between Indian Prime Minister Narendra Modi and Chinese President Xi Jinping since they meet on the sidelines of the Group of 20 summit shortly after the start of the standoff. Monday’s also brings what some analysts had seen as a much longer standoff to a close well before the Communist Party of China convenes for the first plenum of the 19th Party Congress later this autumn. The duration of the standoff was indeed notable for the exceptionally jingoistic coverage in the Chinese press; leaving aside the normally over-the-top coverage of the Global Times, more authoritative Chinese state media outlets, including People’s Daily and Xinhua news agency carried articles condemning India over the standoff. In the end, however, India’s diplomatic and national security apparatus resisted any actions that would turn escalation into a self-fulfilling prophecy. (Accounts vary of the precise tick-tock involved in reaching the resolution unveiled on Monday, but diplomacy was no doubt central.) Despite the tone coming out of China throughout the standoff, which, in all fairness, was returned by many in the Indian press, quiet diplomacy behind-the-scenes prevailed in reaching a mutually acceptable agreement to pull back the armed forces of these two nuclear-armed Asian giants from the standoff point. Given the stakes at Doklam and the several unusual features of this standoff — it was the first instance of India facing down Chinese troops on territory claimed by a third country, Bhutan — the details of Monday’s resolution merit a closer look, both as a tactical and strategic matter. In the end, did India’s mid-June maneuver yield its desired end-state in Doklam or did China gain instead? A dispassionate look at the facts of Monday’s resolution, as presented by both the Indian and Chinese sides, suggests that New Delhi’s gamble in mid-June has paid off at least tactically. In New Delhi’s view, the threat at Doklam concerned the PLA’s attempt to extend the “turning point” of a long-standing road just west of the river known as Torsa Nala, seeking an extension southward toward Jampheri Ridge, a feature perceived to have great strategic importance for the Indian Army. Accordingly, the standoff began after Indian troops interdicted the PLA from beginning any construction to ostensibly extend the road southward toward Jampheri Ridge. On June 30, MEA released a definitive statement outlining India’s position on the standoff. This document outlined that, in coordination with Bhutan, India opposed any unilateral changes to the status quo in the region. With Monday’s resolution, both India and Bhutan have successfully attained their desired end-state: a return to the status quo in Dolam before June 16. China, meanwhile, has released a face-saving statement, noting that Indian troops withdrew from the site of the standoff first — a core Chinese demand since June 16 — and that its patrols in the Dolam region continue. Chinese patrols have taken place in this region for years and their continuation does not represent any unilateral change to the status quo before June 16. Moreover, China’s statement emphasizes that it will “continue with its exercise of sovereign rights” in the area—a sufficiently broad envelope to cover future attempts at changes to the status quo, if the PLA sees it necessary and opportune. But, as I noted in part two of this series, the Doklam standoff was never just about the question of what PLA engineers would or would not be allowed to do to a road on an obscure patch of Himalayan land. The standoff exposed the salience of larger questions about the nature of the relationship between India and China, their management of border tensions more broadly, and of Bhutan’s interests between its two massive neighbors. Additionally, the central disagreement over the applicability of the so-called watershed principle — the fundamental origin of the India-China dispute over the position of the tri-border point at Doklam — remains as open a question as ever. The Chinese Foreign Ministry’s lengthy position paper on these matters, which publicly relitigated the language of the 1890 Sino-British convention among other historical questions, has drawn considerable public attention to this issue. While China may have conceded to a return to the status quo — an outcome rendered palatable with face-saving claims of India withdrawing first — the Doklam region won’t be off the table for future attempts at prodding India and Bhutan. Does the Doklam sage carry lessons for other Asian states facing Chinese attempts at unilaterally changing the status quo in disputed regions? Perhaps not. India’s unique hard power advantages in the Himalayan region give its bargaining position with China something of a unique characteristic that other Asian states facing Chinese irredentism — notably Southeast Asian states in the South China Sea — do not enjoy. The closest analog to India’s position may be Japan in the East China Sea. While India, as of August 28, does seem to have come out on top tactically, previous episodes of Chinese behavior in territorial disputes, including the 2012 episode with the Philippines at Scarborough Shoal, do highlight the potential for quick defection from agreements in Beijing. Even if China does not attempt to extend the turning point of its road near Doka La, it has other options available to improve its position in any future contingency at Doklam without altering the status quo in ways that would trigger Indian retaliation. For instance, China always has the option of fortifying PLA positions at or north of the Sinche-La ridgeline, in undisputed territory or even well in the Chumbi Valley. Another option is that the PLA chooses to fortify existing positions along its road, but east of Torsa Nala. The Torsa Nala river appears to have served as a de facto separating line between the area of the Dolam bowl where the Bhutanese and Indian armies exercise control and carry out patrols. By bolstering its position east and north of Torsa Nala, the PLA could “salami-slice” its way to a more advantageous position in the area anyway. The problem of “salami-slicing” and continued provocations will loom over the India-China relationship going forward. As the acute tensions generated by the Doklam standoff fade, the relationship is likely to return to something like the pre-June 2017 status quo, which was composed of cooperation and competition alike. Recent incidents like the widely discussed stone-pelting episode in Eastern Ladakh’s Pangong Lake area may become more likely too should the PLA choose to escalate again in the aftermath of the 19th Party Congress. For India, the challenge in the aftermath of Doklam too will be to ensure that the existing patchwork of bilateral border agreements with China, ranging from the 1993 agreement that established the Line of Actual Control, the 1996 agreement on confidence-building measures, the 2012 bilateral understanding on triboundary resolution, and the 2013 border defense cooperation agreement, remain in good health. China’s refusal to publicly acknowledge the 2012 understanding, for example, served as an important component of its position regarding the Doklam standoff. All this leaves us with the question of Bhutan, the Himalayan kingdom caught in the middle of it all. The Doklam standoff cast an unusually bright light on an Asian country that usually keeps calm and carries on. The signature impulse defining Bhutan’s foreign policy hand during the Doklam standoff was its silence. Thimphu released one short statement through its foreign ministry and carried on behind the scenes, engaging its close partner India and difficult neighbor China, with whom it still does not have formal diplomatic ties. Reports during the standoff revealed a complex and difficult history of bilateral border negotiations between Bhutan and China with regard to the Doklam sector. Though definitive evidence in the public domain remains out of grasp, reports suggested that beginning in the mid-2000s — before its transition away from absolute monarchy and before the revision of its friendship treaty with India — Bhutan had considered territorial concessions to China in the Doklam sector that would have been unacceptable to India. That New Delhi was able to resolve the standoff attaining its desired outcome without requiring Bhutan to explicitly voice its support for India’s position is notable too. India’s decision to intervene across its border was never explicitly and publicly acknowledged by Bhutan, allowing the Chinese government and media to focus on what appeared to be unilateral interference in what Beijing saw as a bilateral China-Bhutan affair. The Doklam standoff, thus, tested the relationship between India and Bhutan and proved — at least at the government-to-government level — that it remains on sound footing. The question of public opinion of India in Bhutan is another matter, one that we’ll have more evidence for with next year’s parliamentary elections in the Himalayan kingdom. Either way, the choices Bhutan made during this standoff — quietly and behind-the-scenes — will likely bear important consequences for the future of its relationship with both its neighbors. While the standoff at Doklam is over for now, with troops from both India and China having disengaged, the debate over the meaning of this standoff will continue. The question of who “won” at Doklam may appear clear on the tactical level, but the broader strategic and geopolitical picture remains murky. The overall trajectory of the India-China bilateral relationship may remain rocky for longer than either diplomats in Beijing or New Delhi would like from here on out. The Xiamen BRICS summit will be the first test of whether Modi and Xi can treat the diverse gamut of issues in the bilateral without allowing the bitter experience at Doklam to color the relationship. Ultimately, both New Delhi and Beijing, through the experience at Doklam, take away important data on the nature of the other and of their bilateral relationship. India should rightfully acknowledge that its diplomatic maneuvers were both successful at avoiding dangerous and inadvertent escalation while securing a favorable outcome with China. As of this writing, too, the Indian government has proven a graceful “winner,” with prominent officials withholding from any public gloating that could erode the face-saving outcome that ultimately ended up sticking. Even if Indian skepticism of Chinese intentions irreversibly deepens as a result of the standoff, the experience at Doklam may color India’s approach to dealing with China for years. China, meanwhile, may reassess Indian resolve in the Himalayas. One of the root causes of the whole affair at Doklam was perhaps the PLA’s miscalculation that the Indian Army would not take drastic and unprecedented action to forestall the extension of the road. If Doklam lowers the PLA’s perceptions of the thresholds required for Indian action against changes to the status quo across the length of the two countries’ disputed border, it could, if paired with diplomacy, even solidify existing border and confidence-building mechanisms. The conclusion of this summer’s standoff will no doubt inspire introspection and review in both India and China of how each assesses the other’s interests and objectives. The outstanding border delimitations between them are now but details—minutiae in the grand scheme of things. The Doklam standoff ultimately is but another chapter in the still-ongoing story of how Asia’s two rising powers—despite their mutual mistrust—manage their differences in the 21st century. Editor’s Note: This article is the final installment in a series by the author on the Doklam standoff between India and China this year. See part one on the political geography of the crisis here and part two on the factors sustaining the standoff here.